The present training units can support you in improving your team's handball-specific fitness, especially in terms of speed, speed endurance, and strength. The strength training units focus on improving core stability with musculoskeletal and dynamic stabilization exercises. Stability plays an important role in handball, as it is crucial to a high physical performance and can prevent injuries. Considering speed and speed strength, reflexive jumping power, short sprints, and speed endurance are especially important. These skills are essential for succeeding in handball. 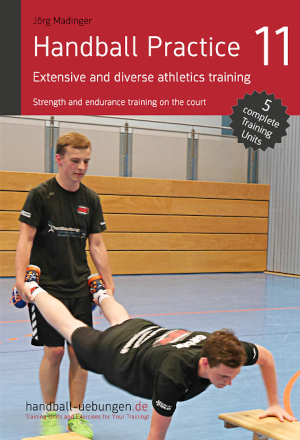 The training units combine course strength trainings with short contests and handball-specific exercises, thus showing the possibilities for creating a diverse fitness training that is also fun for the team. The present training units are designed for older youth teams and adult teams. Hence, certain physical requirements must be met. The exercises can also be used in the training of younger teams, however, you have to make sure that the difficulty level is appropriate for the younger players.